When a disaster strikes, how long can your business survive without access to its critical data? Weeks? Days? Hours? Minutes? 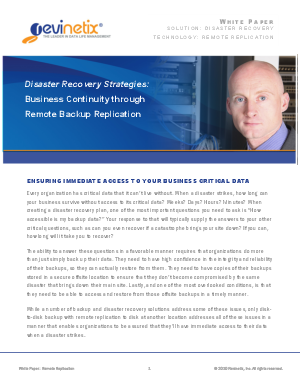 When creating a disaster recovery plan, one of the most important questions you need to ask is “How accessible is my backup data?” This white paper discusses different DR solutions and technologies, including how two organizations, University of Virginia-Wise and iFreedom Direct, are using Revinetix disk backup remote replication as their enterprise-class disaster recovery solution.